To many, the Arctic is a faraway and mysterious place. To others, it’s home. To many Canadians, it’s an important part of our identity, making up almost 40% of Canada’s landmass and two-thirds of our coastline. The Arctic is home to the Inuit, who have lived there for thousands of years, and to remarkable species – like polar bears and narwhal – many of which live nowhere else on the planet. 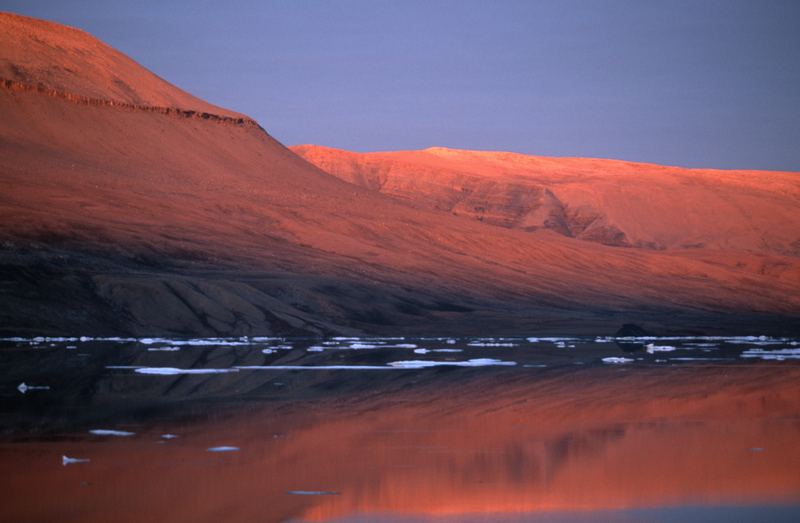 The Canadian Arctic is a special place for conservation. Where else in the world do we have the same opportunity to safeguard a place that is still, in many ways, pristine, with species living in ecosystems barely touched by human activities? Here, we have a chance to learn from past experiences and get things right from the start with smart long-term planning based on scientific and traditional knowledge. There are few places in the world where we still have the same opportunity. And now is the time to begin. We know that the Arctic is changing at a record pace, one unseen in previous generations. It is warming at twice the average global rate, causing sea ice – the foundation of Arctic life – to melt, changing the face and reality of the region. These changes are affecting wildlife and communities, offering both challenges and opportunities. The opportunities are important for northern communities in need of economic growth and jobs. 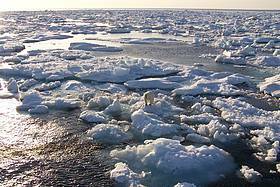 The melting Arctic offers new prospects for development, particularly in mining and oil and gas development. Accompanying any new industry will be increased shipping, as supplies and resources are moved in and out of the Arctic, and possibly greater cross-Arctic travel as shipping companies try new, shorter routes. The challenges are clear: the rapid pace of warming puts Arctic wildlife at risk, as animals struggle to adapt to new terrain, changing food availability, and new predators and competitors. And while economic development is much needed in the region, it is not without risks, including oil and contaminant spills, increased noise, disruption from new traffic, and the introduction of invasive species. These changes can also put the wellbeing of communities – many of which rely on these species as a traditional food source and part of their culture, and on the sea ice as an important means of transportation – at risk. 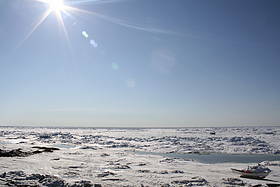 Polar bear (Ursus maritimus) on the sea ice along the coast. Svalbard, Norway. Fortunately, it’s not an ‘either/or’ choice – both development and conservation agendas can be pursued at the same time, in balance. And, indeed, they must be, as conserving important ecosystems is fundamental to a creating a healthy long-term economic and environmental future for the region. 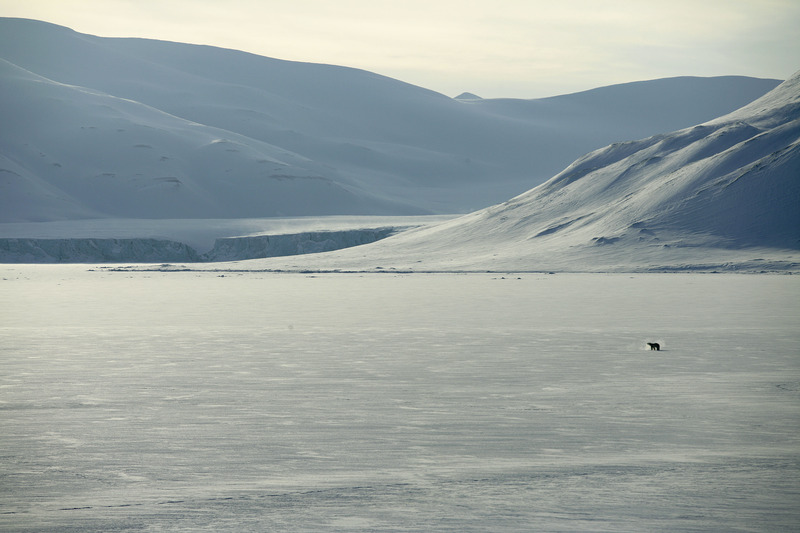 Learn about WWF’s work in the eastern Canadian Arctic. 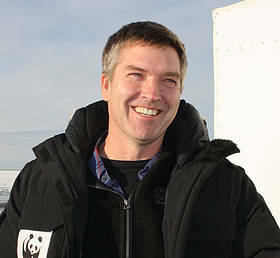 Learn about WWF’s work in the western Canadian Arctic. 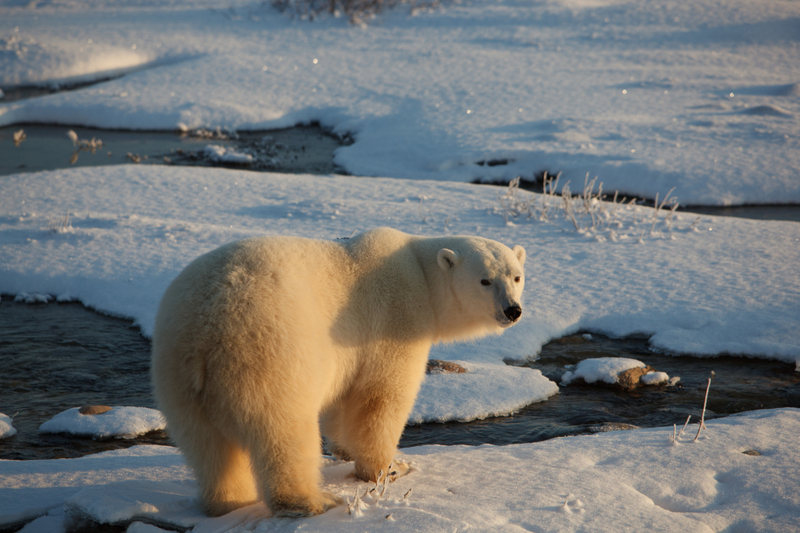 Learn about WWF’s work on Arctic oil and gas issues. 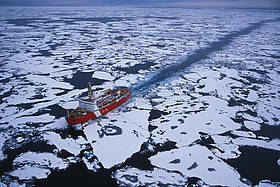 Learn about WWF’s work on Arctic shipping. 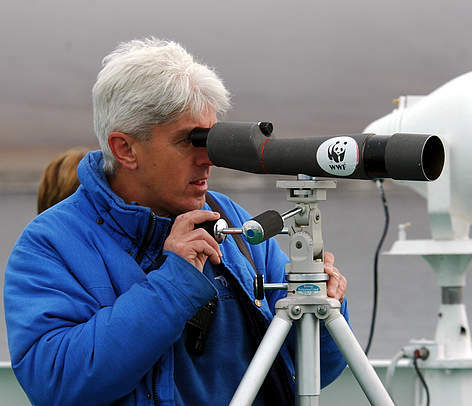 Dr. Peter Ewins looks through telescope in the Arctic. Arctic communities face ever-increasing regulatory processes relating to major industrial projects and conservation areas. WWF-Canada will work to strengthen community voices for conservation by securing funding to support local interventions. We will also link communities with the legal and technical expertise they need to intervene effectively. Diesel fuel is the primary energy source for Arctic communities—a dependency that has high logistical and financial costs, negatively impacts the environment, and also hinders the self-sufficiency of northern communities. WWF-Canada will work to build capacity for low-impact renewable energy, such as wind, solar and hydropower. Often, mining or oil and gas extraction is portrayed as the only solution to northern poverty. One sector that holds promise for stable, long-term employment is commercial fishing. WWF-Canada will work with communities to build sustainable fisheries, as well as monitor legislation and policy to ensure long-term sustainability of Arctic fisheries. We are working with local communities to prevent risky oil and gas development, protect habitat using science and traditional knowledge, and build cross-border collaboration between Inuvialuit (Canada) and Inupiat (Alaska). This iconic Canadian Arctic region is a priority for WWF-Canada and overlaps with the last ice area, the eastern section of the Arctic Archipelago where summer sea-ice habitat will persist the longest as the planet warms. We will work with local people, as well as federal and territorial governments, to secure protected areas and conservation management. We will also focus on shipping and extractive industries to promote safe, sustainable Arctic development. We will also model the potential impacts of oil spills on wildlife and local communities to inform decision-making. Lancaster Sound: Lancaster Sound, known as Tallurutiup Tariunga to the Inuit, is a unique Arctic ecosystem known around the world for its rich biodiversity and abundant marine life. 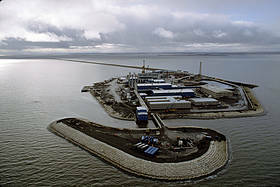 An important refuge for marine mammals and fish, the region is also an important food source for neighbouring commmunities which include Pond Inlet and Arctic Bay. WWF-Canada supports Inuit action for a Lancaster Sound protected area and have launched an interactive map to raise awareness of the importance of the region. 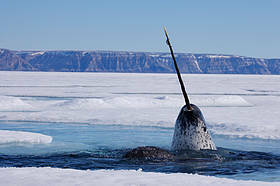 North Water Polynya: This area remains ice-free throughout the winter and is critically important for narwhal, beluga, bowhead whales and more. Canadian and Greenlandic Inuit communities are calling for a bilateral commission to consult on the protection and future use of this polynya. WWF-Canada will support these efforts and carry out oil-spill trajectory modelling to inform decision-making. Everyone has a role to play in securing a healthy Arctic future today. We must all work together to slow the impact of rapid climate change in the region, and to choose the right future for the Canadian Arctic. It’s a land of great conservation opportunity, where we have a chance to set well-informed plans in place, heeding the lessons from past development successes and mistakes that have already happened around the world. In the Canadian Arctic, we have an almost clean slate, ready for us to make the right choices. 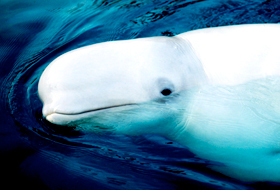 Learn about the risk of oil spills in the Beaufort Sea at arcticspills.wwf.ca. 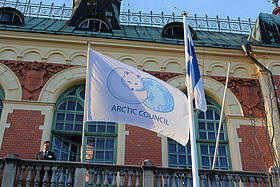 Learn about WWF’s work with the Arctic Council.